Most megayacht concepts are motoryachts. 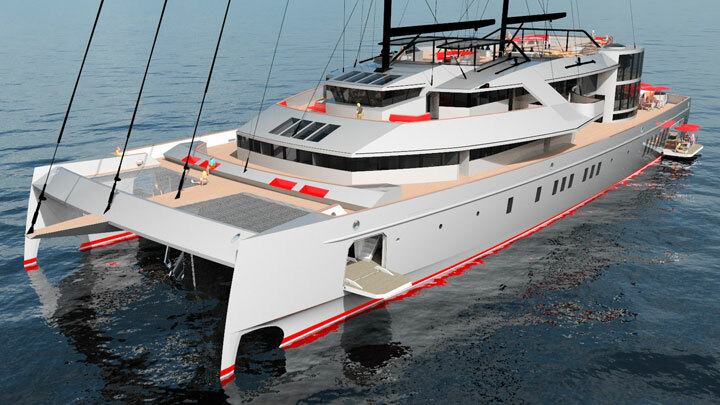 The catamaran configuration for Spectrum 61 therefore makes her stand apart. So, too, does the 200-foot (61-meter) LOA, plus a beam and decided emphasis on entertainment that will make other owners envious. Spectrum 61 comes from the drawing boards of Australia’s Sedlmayer Associates. 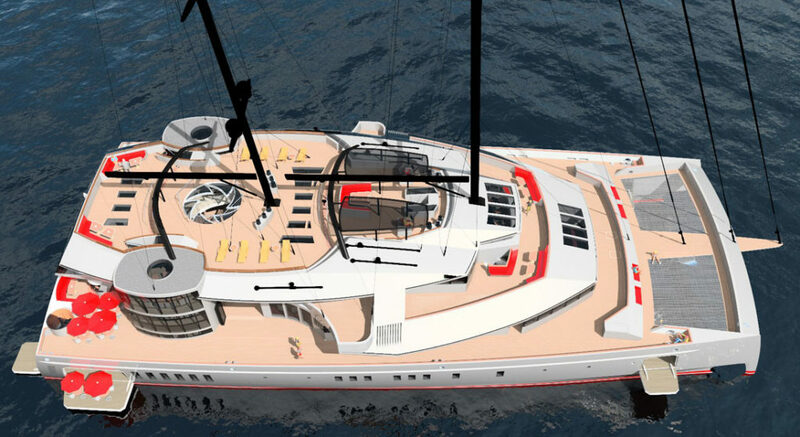 The design studio is owned by Albert Sedlmayer, who has penned a number of sailing and power catamarans on the water. The beamy nature of catamarans means expansive spaces to enjoy. Spectrum 61 has nearly 86 feet (26.2 meters) of width. Sedlmayer envisions the owners being active, welcoming cruisers. That’s why there are beach clubs in each hull, and two tender-mooring areas just forward between the hulls. Friends and family can shuttle to Spectrum 61 from shore—or from other nearby yachts. Sedlmayer further sees both the fold-down platforms of the beach clubs and the sides of the main aft deck serving as dockside cafes, not mere relaxation zones. Before and after meals, Spectrum 61 provides guests with an abundance of entertainment options. 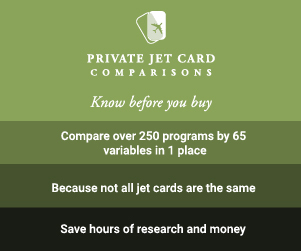 They can head down to the underwater-viewing room, or the private, THX-certified cinema. An infinity pool sits prominently positioned on the main aft deck, too. After-dinner drinks are ideal for enjoying at the piano lounge and bar. It’s on the lower level of the atrium hall, as Sedlmayer puts it. Six guest suites and accommodations for 13 crew are aboard Spectrum 61. The owners’ suite, a VIP suite and lounge, and captain’s cabin are all on the upper deck. The crew have a rec room on the lower deck near their cabins, forward of the engine room. So, too, do they get a dedicated galley and mess. Sedlmayer paid good attention to crew’s working needs as well. Fold-down sea doors between their area and the forepeak aid loading supplies. A refrigerated trash compactor is ideal for long voyages. And, the twin helms have fixed canopies. Speaking of the helms, Sedlmayer has done performance studies for Spectrum 61. He says she’ll be capable of 20 knots under sail or power in ideal conditions. Power comes from twin MTU 12V 4000 M71 diesel engines. Spectrum 61 can carry nearly 18,300 square feet (1,700 square meters) of sail area and can clear the Golden Gate Bridge in California. Air draft is 218 feet (66.5 meters). Keeping the catamaran more eco-minded, Sedlmayer has also included BIPV panels. They’re photovoltaic panels incorporated into the structure, versus mounted on top. There’s one more creature comfort of note. Sedlmayer includes a gym on the lower deck of Spectrum 61. But, in our opinion, why bother? 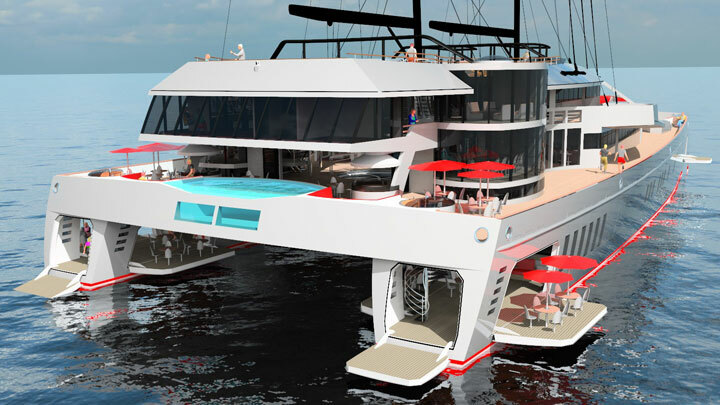 He also designed an 8-foot-wide (2.5-meter-wide) “promenade” around the yacht, where eight laps equal 1 kilometer.